Teeth help you do more than smile and chew, they can also make speaking easier and help your face maintain its shape. If you’re missing some or all your teeth, there are several options available to help you address this concern. As an extensively trained dentist, Dr. Donian Shen offers innovative solutions that can give you a beautiful smile and functional teeth that last for years. 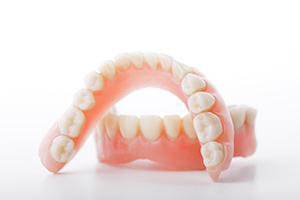 Full and partial dentures are one of the most popular restorative dentistry options, and we can assist you in determining which procedure can optimize your results. Traditional dentures can slip or sometimes feel uncomfortable, but at Smile By Design, we take great care to provide high-quality dentures that can sit comfortably and securely in the mouth. If you ever experience an issue with your dentures, we encourage you to reach out to us promptly to correct the problem. As with natural teeth, excellent oral hygiene will be necessary for your dentures to remain functional and cosmetically appealing for as long as possible. We can recommend a special denture toothbrush, denture cleaner, and adhesive for you to use to care for your teeth and keep them firmly anchored. When you first begin wearing your dentures, you should be careful to avoid accidental bites to your tongue or cheeks as you grow accustomed to your new smile. You may also salivate more, notice some taste changes, or experience some gum soreness as you adjust to your new teeth, though these effects should subside over time. If you experience lasting discomfort, please contact us, and will make the necessary adjustments. We encourage you to visit our office regularly so we can monitor the health of your gums and ensure the dentures are in excellent shape.